Hello! OMGosh today was so hot and muggy!! 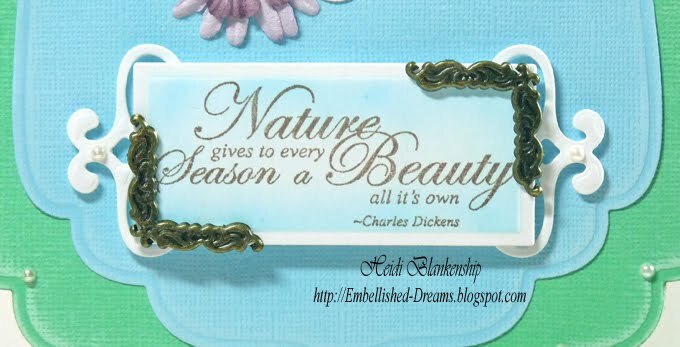 But I guess we should enjoy the warmth while we have it because it won't be long and it will be gone! 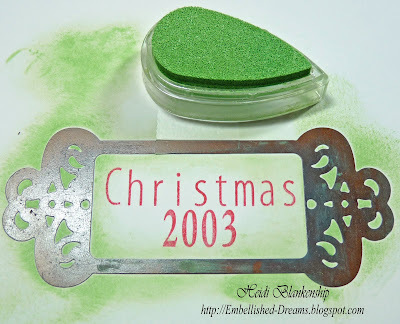 Today I have a Christmas scrapbook layout to share with you using My Mind's Eye paper, JustRite stamps and Spellbinders™ die templates. I love these photos of our little guy! He has always loved having his pictures taken and still does--so I grab every opportunity I can. 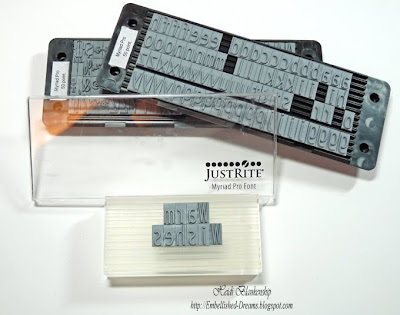 *wink* After I had all of my supplies picked out I created the custom tag to go with the layout using the JB-08097 Myriad Pro-50 points and Times New Roman font stamps from JustRite Stampers along with the JB-09520 Clear Horizontal Stampers-2 pack. 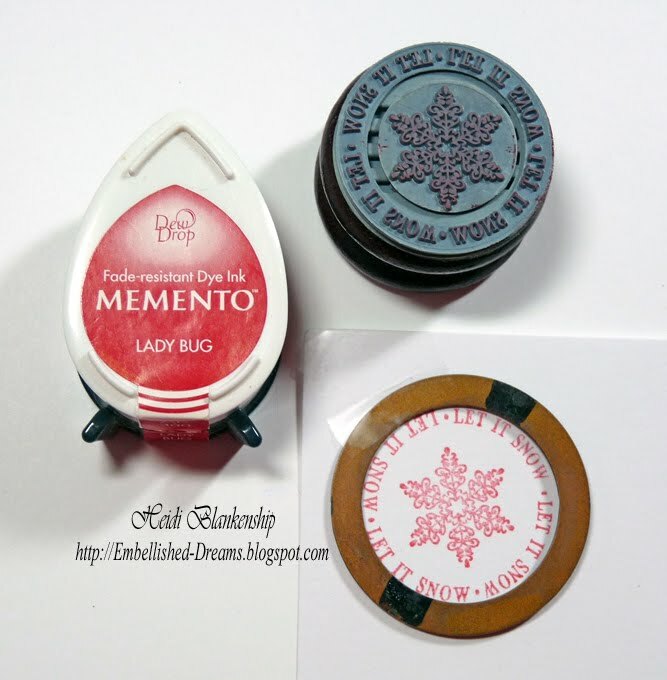 I used Lady Bug Memento Ink to stamp the sentiment. Then I wanted to use the S4-235 Fancy Tags die template to cut/emboss the diecut. 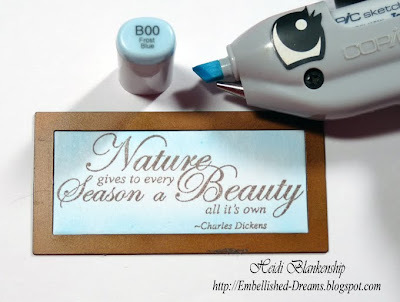 I taped the die template so it would be centered with the sentiment and stay in place while cutting and embossing. 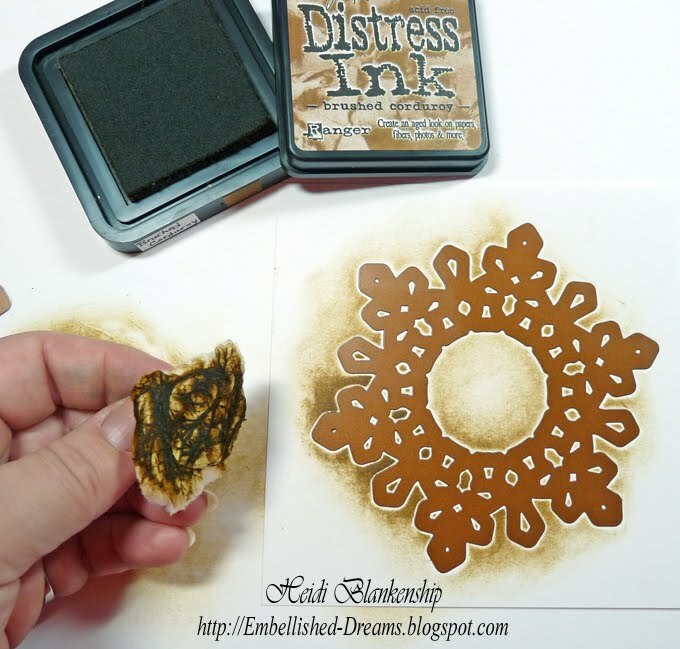 Next I used Wasabi ink to stencil through the die template. 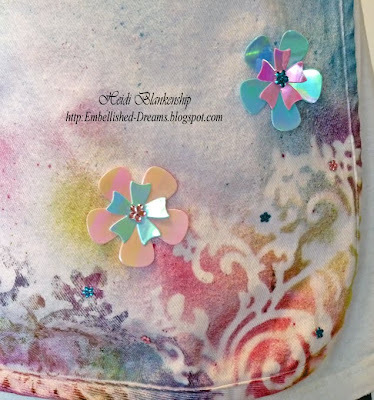 Here is a close-up of the tag. 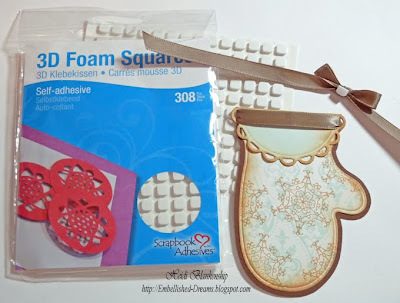 I used 3D Foam Squares from SCRAPBOOK ADHESIVES By 3L™ to add a little dimension to the tag. To create the ornaments I used S4-283 2010 Heirloom Ornaments dies #1, #2, #3. For the larger ornament I used a sentiment diecut from My Mind's Eye and then I cut/embossed a snowflake using the center piece of the S4-286 2010 Snowflake Pendants. I added 3D Foam Squares from SCRAPBOOK ADHESIVES By 3L™ and red/gold cord. 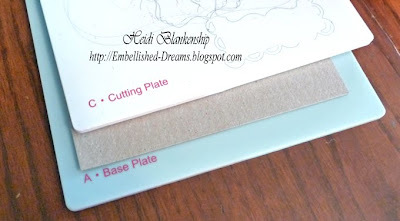 To cut/emboss the photos I used S5-025 Labels Seventeen dies #5, #6 from Spellbinders™. Then I lightly sanded the edges for the white embossed outlines. Paper: WorldWin Red, My Mind's Eye The Merry Days of Christmas "Holiday Shimmer"
Thank you so much for stopping by today! Happy Creating!! Hello! Well, it's the start of a new week. Where oh where did the weekend go??? We went to see Nanny McPhee 2 this weekend---LOVED IT!!! What a Fantastic movie!!! Tomorrow is the start of the new school year for our youngest and he is excited! I have to admit mom is a little excited too--LOL! *wink* Today, I have a Christmas card to share with you. 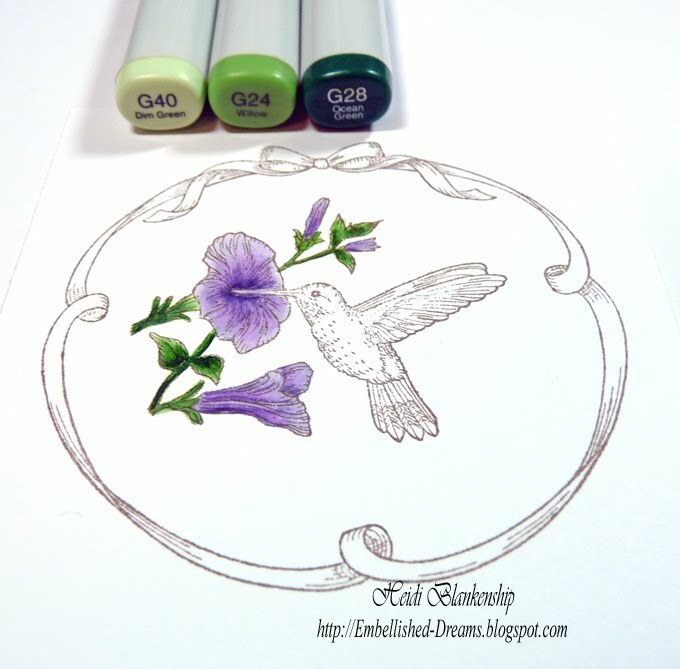 The color combination is a little different but I love the softness of the colors. 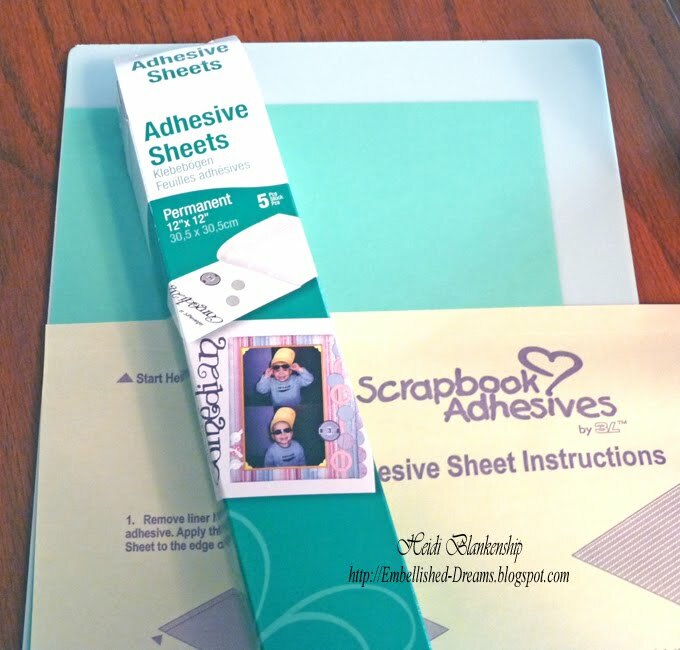 The pattern paper is a very pretty soft aqua and antique white. 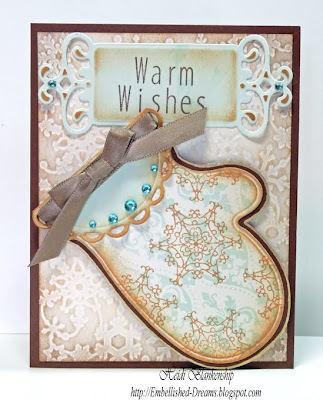 To start I made two diecuts using S4-293 Lacey Circles die #3 and S4-285 Nested Mittens die #3 from Spellbinders™. I folded the circle in half and inked the edges. For the mitten I randomly stamped a snowflake image from JustRite Stampers JB-09795 Whimsical Christmas using a JB-09505 Clear 2'' Round Stamper and then inked the edges with Tea Dye ink. 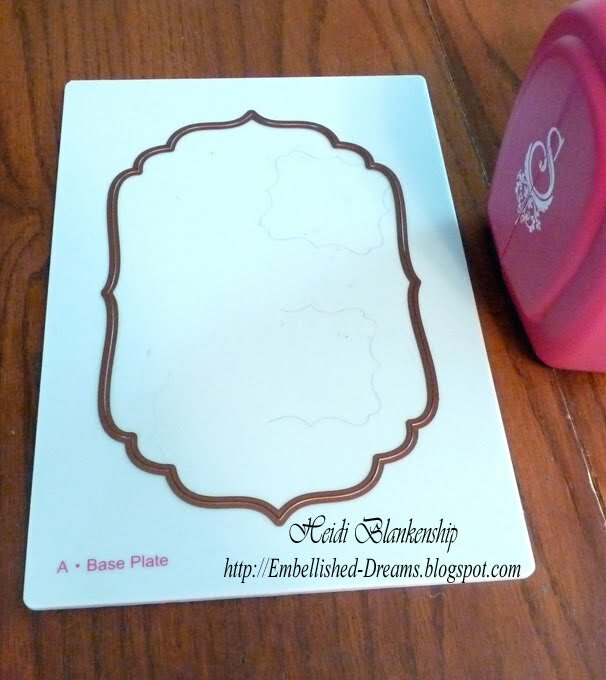 The mitten die template that I used was the largest in the set so to create a brown mat just simply laid the die template on your paper, trace and hand cut for a perfect mat. Adhere the two pieces together and then add the circle at the top to create a pretty cuff for the mitten. I used the NEW My Stik™ from SCRAPBOOK ADHESIVES BY 3L™ to adhere all of my pieces together. Then I ran a ribbon through the loops on each end and attached it to the backside of the mitten. 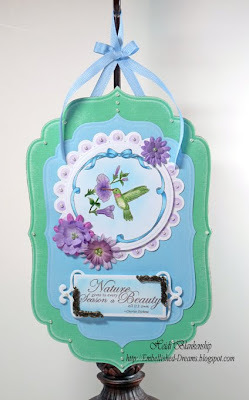 To add a bow on top I used 1/2 of a small 3D Foam Square from SCRAPBOOK ADHESIVES By 3L™. 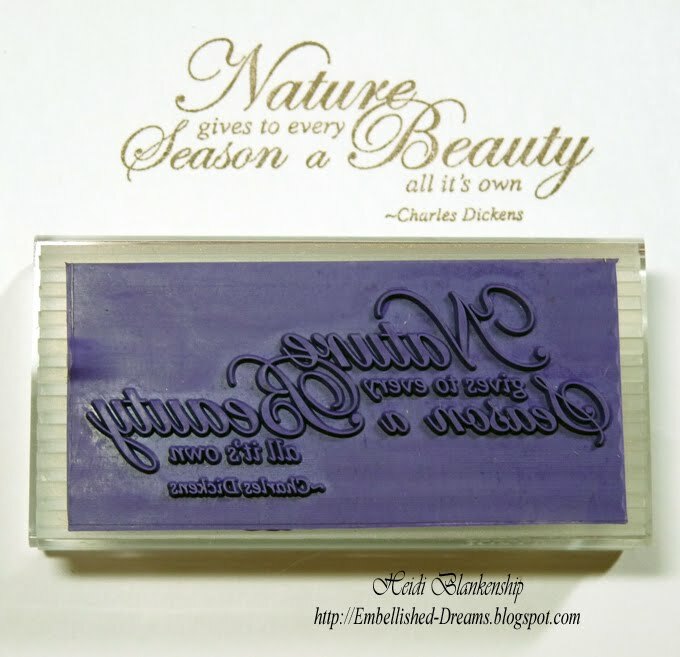 For the sentiment I used the NEW JB-08097 Myriad Pro Font-50 points along with the JB-09520 Clear Horizontal Stampers-2 pack (1-5/8'' x 3-1/2''). 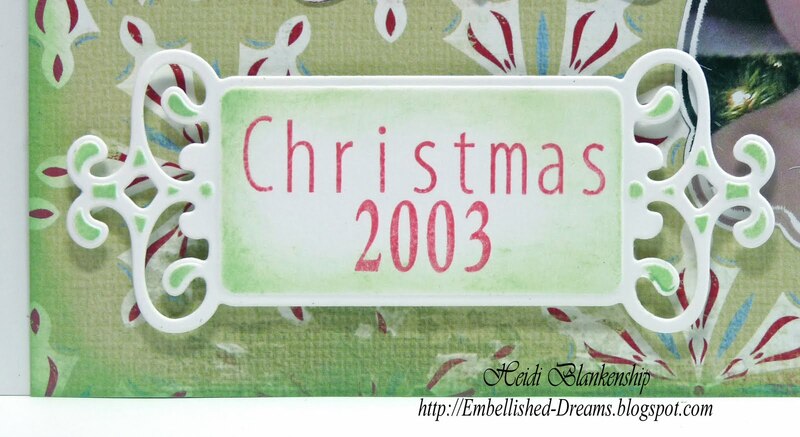 I love the simplicity of this font set! I stamped the sentiment "Warm Wishes" using Rich Cocoa ink. Then I used the Grand Calibur™ from Spellbinders™ along with the S4-235 Fancy Tags die template to cut/emboss the diecut and then I stenciled through the die template with Tea Dye ink. 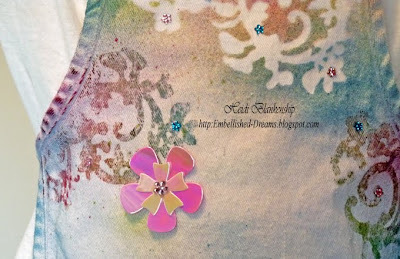 Here is a close-up of the tag. I also added Lush Blue rhinestones. 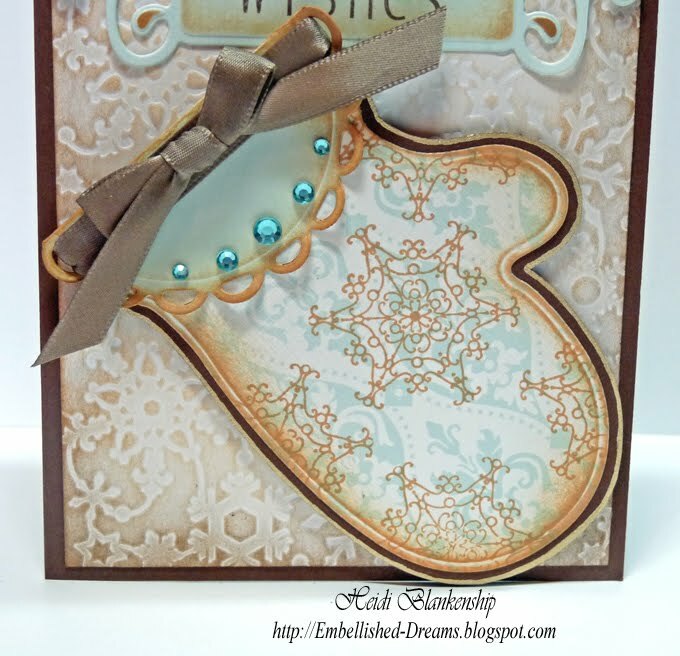 Here is a close-up of the mitten and the embossed background. 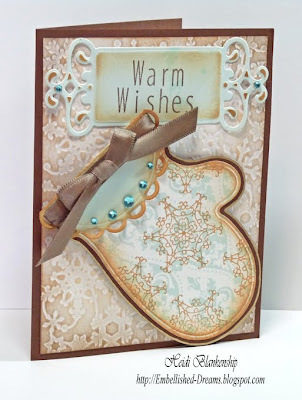 To create the background I used I2-1003 Snowflake Impressabilities™ and then inked the paper. 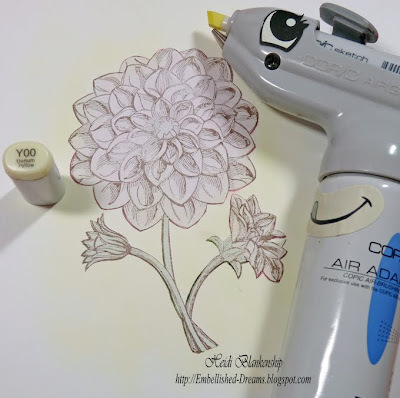 Thank you so much for stopping by today and I hope you have a Great Monday!! 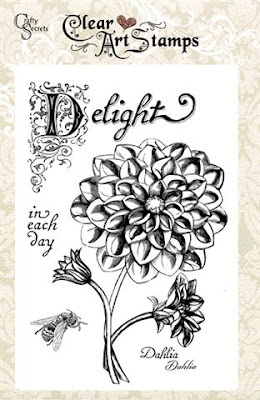 Happy Sunday afternoon to you! Wow--it's such a Beautiful day--a little on the warm side but I guess we better enjoy it while we can. I know it won't be long and the weather will be changing. 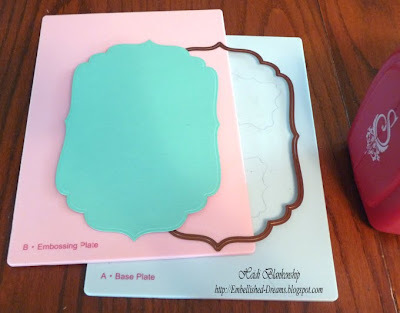 Today I have a fun non-paper crafting project to share with you. I created this fun and artsy apron for a sweet little girl who's mom is a very dear friend of mine. Her little girl loves to hang out with mommy in her studio so I thought she should have something special for when she is crafting with mommy. 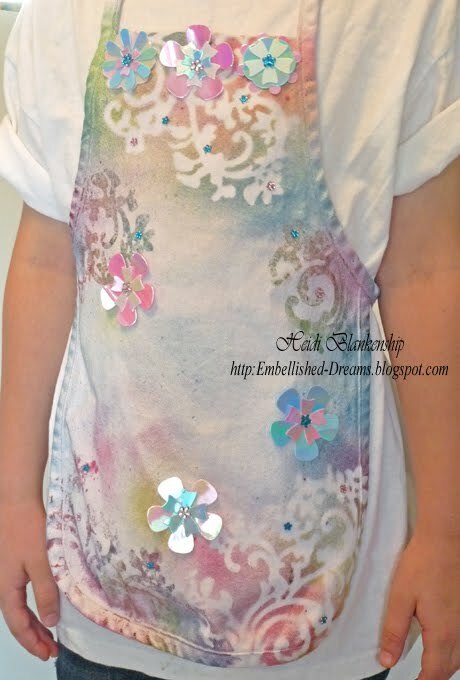 I started out with a white child's apron and it was so fun, quick and easy to make! 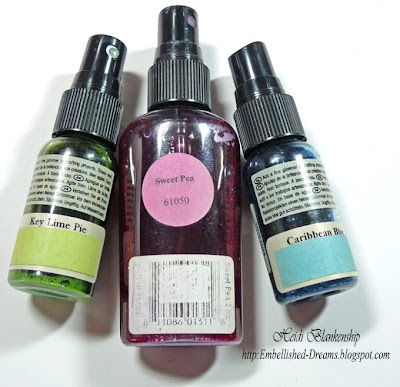 To start I used three colors of Tattered Angels Glimmer Mist-- Key Lime Pie, Sweet Pea and Caribbean Blue along with one of the Glimmer Screens from the Garden Blossom Set. 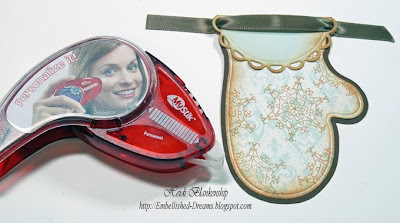 I used a tweezers to hold the Glimmer Screen in place while I was adding the Glimmer Mist. 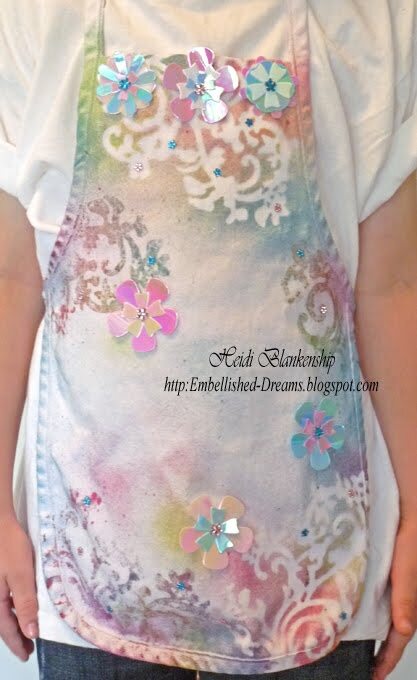 I also turned the Glimmer Screen around and used it kind of like a stamp pressing it down onto the apron and transferring the Glimmer Mist. 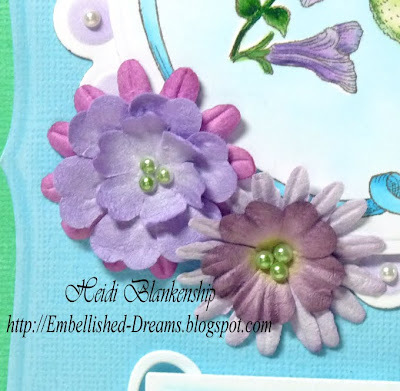 To create the flower diecuts I used the Grand Calibur™ and S4-192 Blossom die #2, S4-109 Flower Creations Three and S4-072 Flower Creations from Spellbinders™. The material I used for the flowers is called Shimmer Sheetz by Elizabeth Craft Designs and I used four colors of the Shimmer Sheetz--White Iris, Light Pink Iris, Pink Iris and Blue Iris. Shimmer Sheetz is an iridescent Mylar. Here is a close-up of the bottom of the apron. Another close-up of the middle. And here is a close-up of the top of the apron. 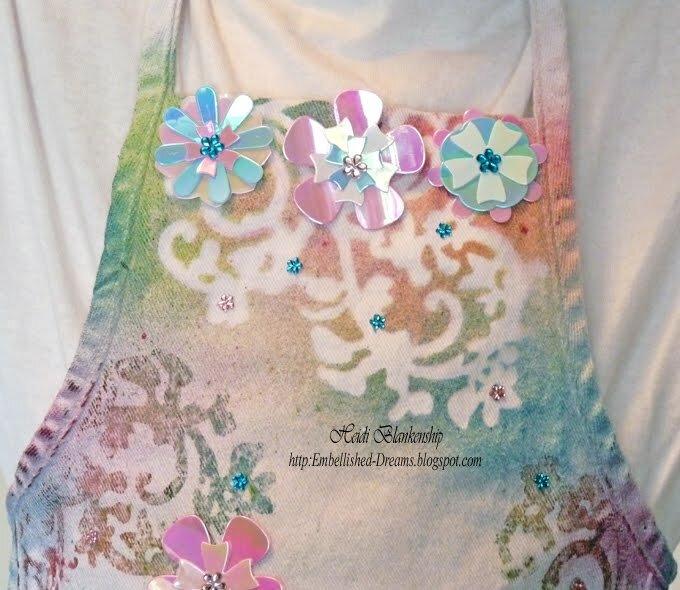 I also added Kaiser Craft Hot Pink and Blue Flower Rhinestones. Thank you so much for stopping by today and I hope you are having a Fantastic Weekend!! Hello! How is your weekend going? I hope it's a good one! Today, I have some quick little 4 x 4 cards to share with you using JustRite stamps and Spellbinders™ die templates. 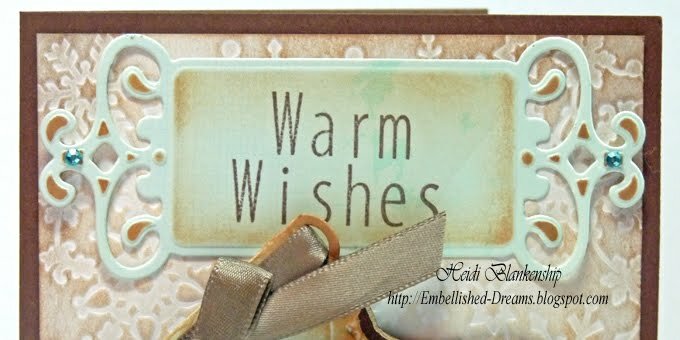 I created a set of four snowflake Christmas cards. I love the look of the Kraft paper with the white & red. 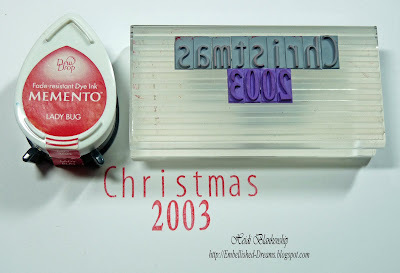 To start I stamped the center snowflake and one of the borders from the JB-09770 Holiday Cheer stamp set from JustRite Stampers onto white paper using red ink. 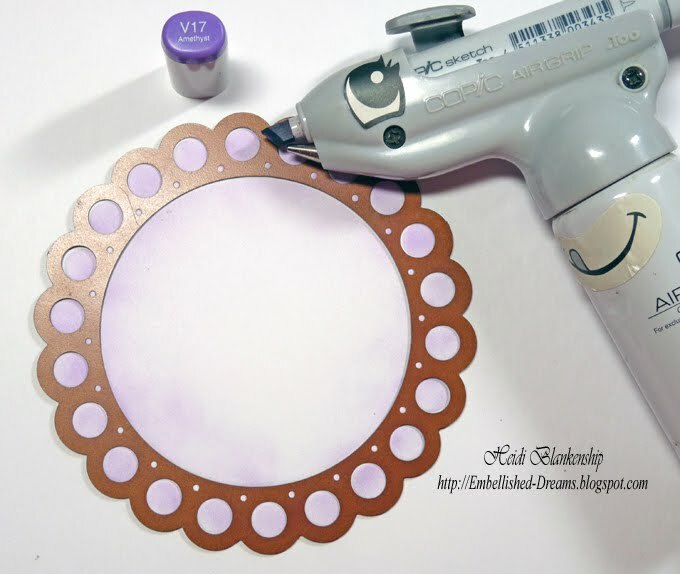 Then I made the diecut using S4-114 Standard Circles Large die #2 from Spellbinders™. 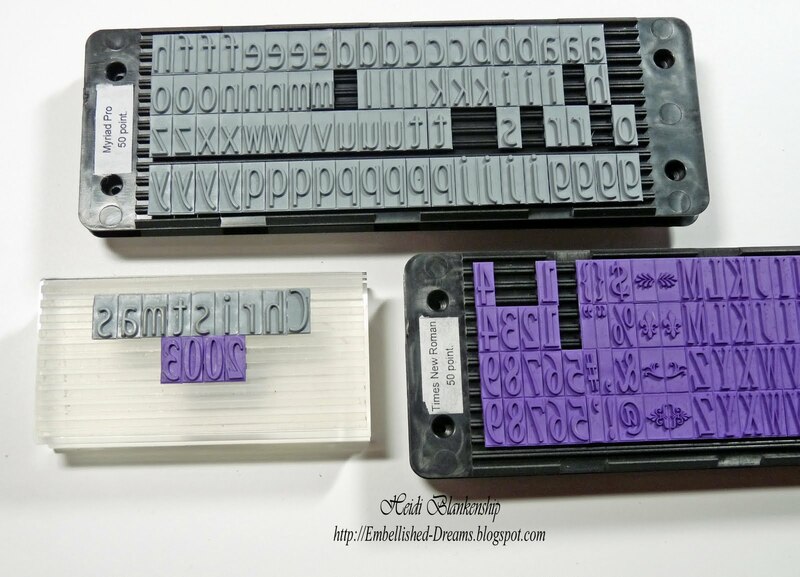 For a perfect placement I add a piece of tape to the die template to make sure it doesn't move. 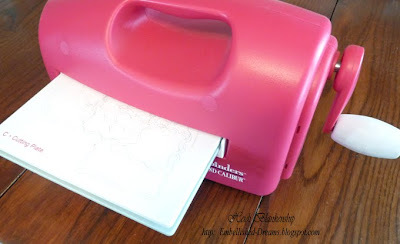 Then cut/emboss all of the diecuts using the Grand Calibur™. 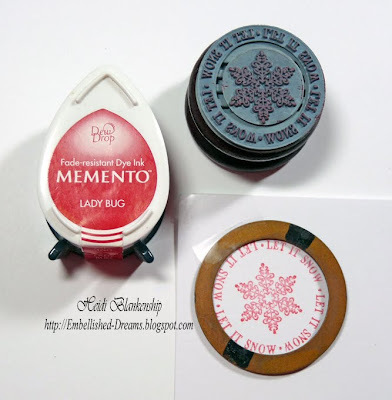 After I cut/embossed the snowflake then I stenciled through the die template with distress ink. Then I removed the diecut and inked around the edges. 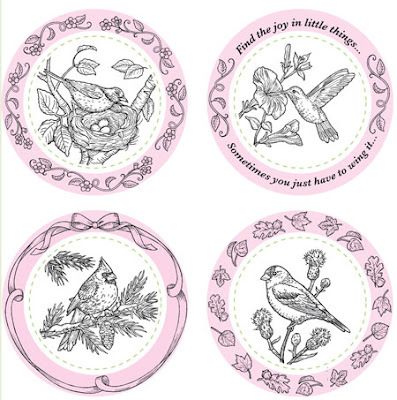 I also inked around the edges of the circle and crown circle diecuts. I brushed glue on to the pendant snowflake and added clear chunky glitter. 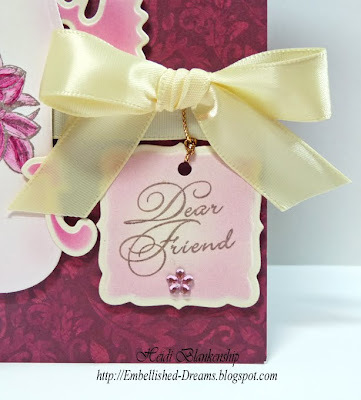 I layered and added dimension to the card by using 3D Foam Squares from SCRAPBOOK ADHESIVES By 3L™. 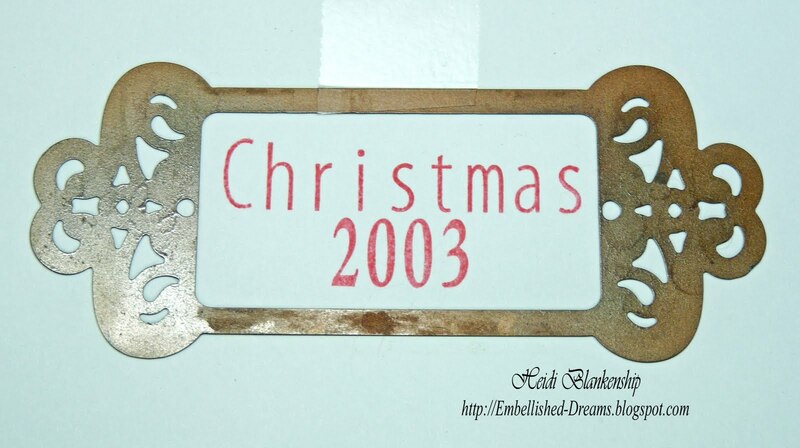 Once all of the diecuts were on then I added red rhinestones. Thank you so much for stopping by!! Happy Creating!! Hello! Wow, I can't believe how fast this week flew by!! 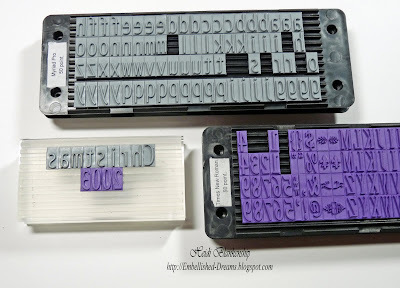 I have been working on several project I can't share with you just yet but I have been BUSY this week--LOL! 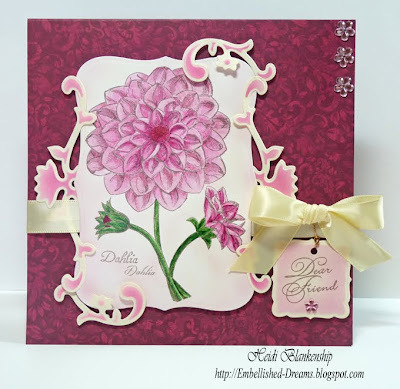 Today, I have a floral card to share with you using the New Dahlia stamp set from Crafty Secrets. The Dahlia stamp set is a medium set with beautiful details! 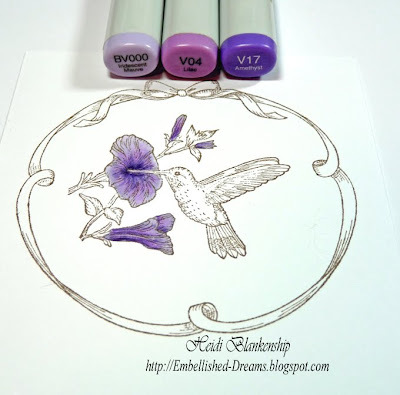 I stamped the image onto white cardstock with brown ink and colored with Copic markers. 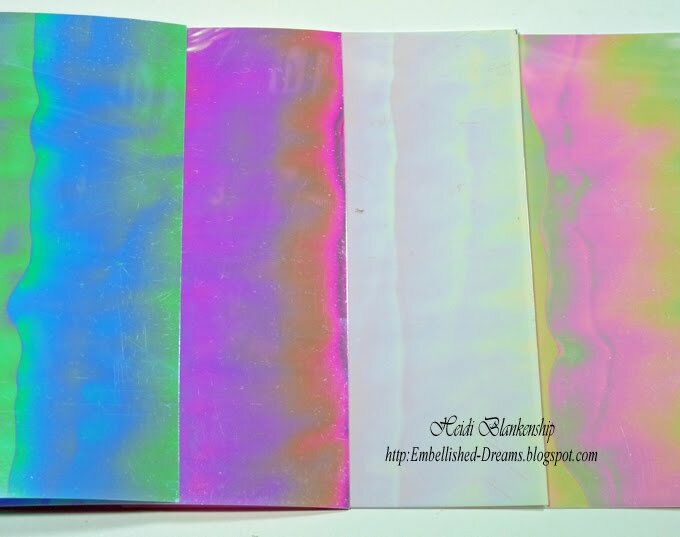 After the image was colored I stamped the image again onto printer paper and hand cut the image to create a mask. For creating a mask I always cut the image a little smaller than what it actually is, this way you can get right up to the lines in the image. 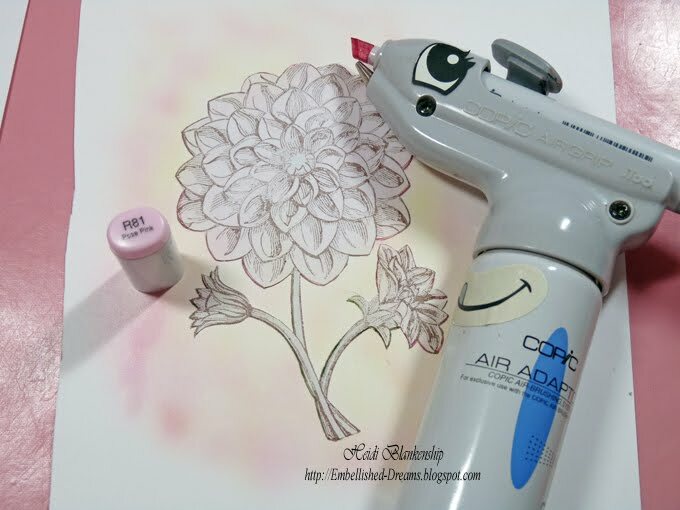 Then I used a Copic marker to airbrush. 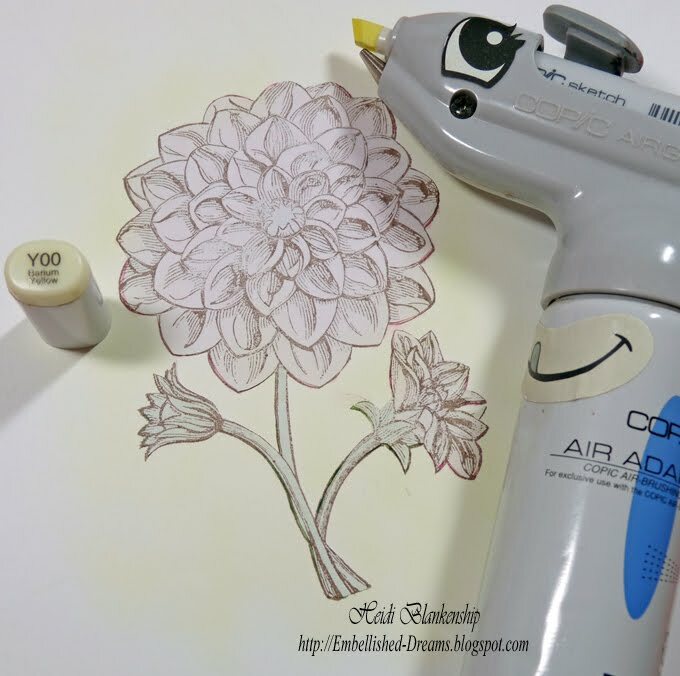 I added a second color with the Copic airbrush. 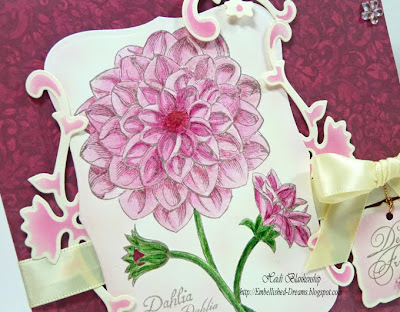 I used the S5-019 Labels Eight die #5 to cut/emboss the dahlia image. For the flourishes I used S4-199 Floral Accents, with Ivory cardstock and airbrushed with a Copic markers. 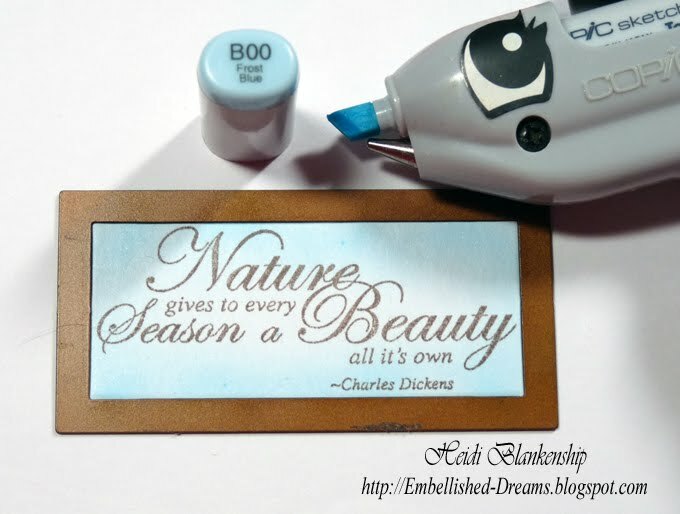 To create the tag I stamped a sentiment from the Crafty Secrets Card Sentiments and cut/embossed using S4-291 Labels Fifteen die #2 and then airbrushed with a Copic marker. Here is a close-up of the dahlia. Another close-up of the tag. I also added ivory ribbon with a bow and some pink flower rhinestones. Thank you so much for stopping by today! 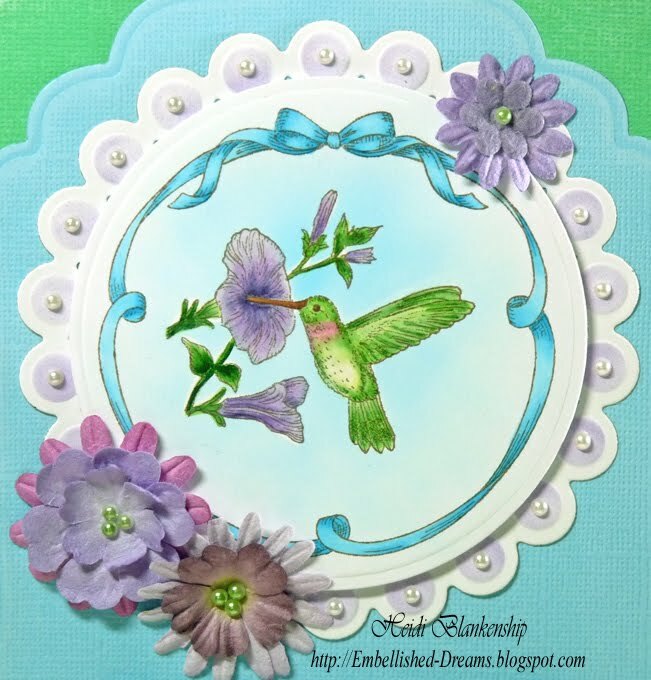 I hope you have a Wonderful Weekend!! Hello! 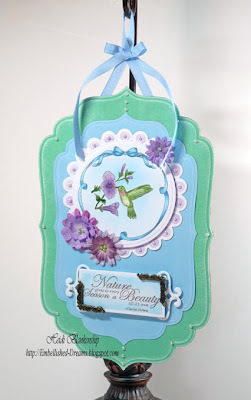 Today I have a wall hanging to share with you and I have to say I had so much fun creating it! 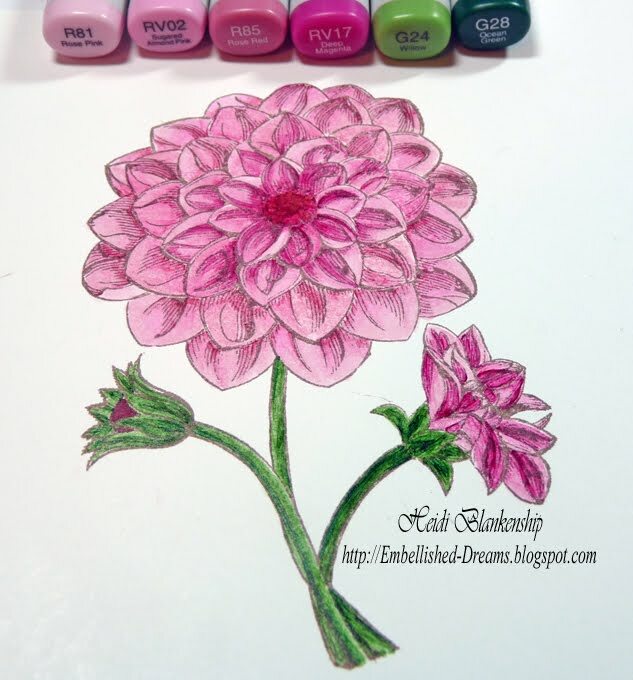 I loved coloring the images and I am very happy with how it turned out--Love it when that happens!! 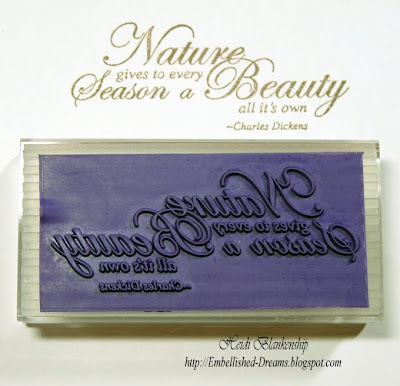 *wink* Have you been following the JustRite® Stampers Blog this week? Monday, Tuesday and Wednesday of this week New JustRite® Stampers Releases are being revealed. On Monday JB-09230 Backyard Birds was featured, Tuesday was JB-09800 Nature Nested Sentiments and Verse and for today you will have to check out the JustRite® Stampers Blog (a little later this afternoon) to see the New Release. Here is the wall hanging that I created using JB-09230 Backyard Birds, JB-09800 Nature Nested Sentiments and Verse, JB-08117 Wood 3-1/4'' Round Stamper and JB09520 Clear Horizontal Stampers-2 pack (1-5/8'' x 3-1/4'') all from JustRite® Stampers. 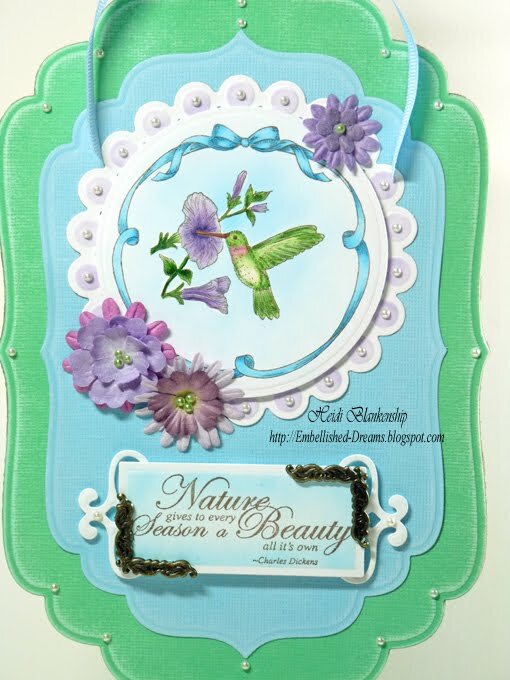 I also used the NEW Spellbinders™ Grand Nestabilities™ LF-190 Grand Labels Four Die #5, #6 and the Grand Calibur™. I started by stamping the humming bird image and border from JB-09230 Backyard Birds onto white cardstock with Memento Rich Cocoa ink and then coloring the flowers with Copic Markers. Next I colored the leaves with Copic markers. 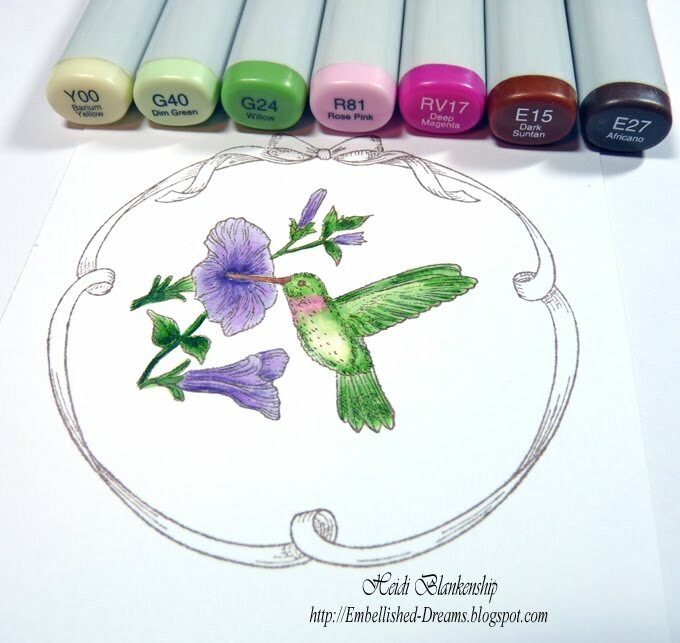 Then I colored the humming bird. Next I colored the ribbon border and airbrushed in the center. I created a mask to cover over the image of the humming bird but I forgot to take a picture. 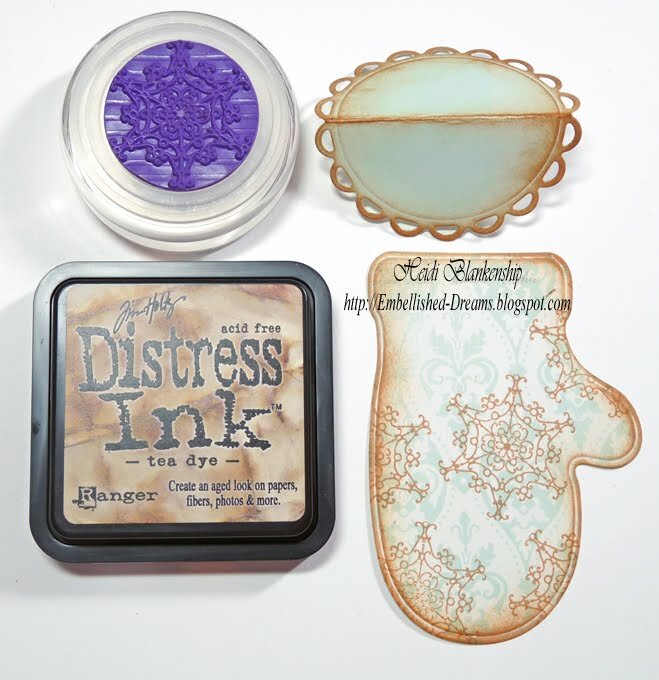 Creating a mask is a great way to prevent image from becoming colored when airbrushing. I used the S4-116 Standard Circles Small Die #7 to cut/emboss the circle diecut. I taped it in place for perfect positioning around the image. 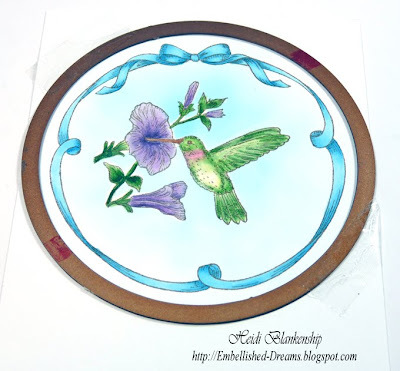 For a background piece behind the image of the bird I used S4-292 Beaded Circles Die #4 to create the diecut and then airbrushed with a Copic marker. 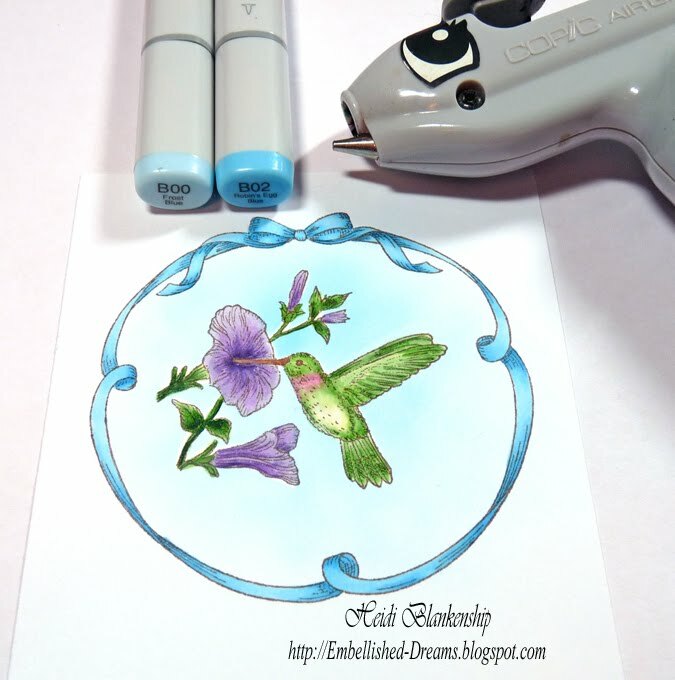 Here is a close-up of the humming bird image. I used 3D Foam Squares from SCRAPBOOK ADHESIVES By 3L™ to add a little dimension and added Prima flowers and pearls. Thank you so much for stopping by today! 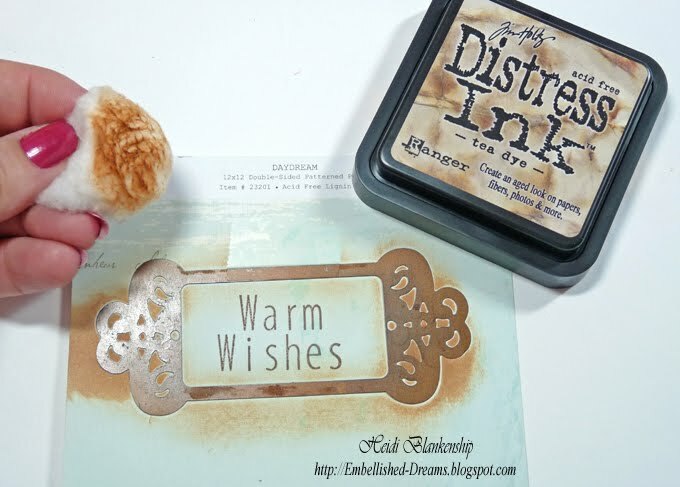 Don't forget to check out JustRite® Stampers Blog to see another Fantastic New Release and some FABULOUS creative inspiration!!! FREE JustRite 2010 Catalog & Idea Book! !